This Birthday Box of Nana's favorites will include: 1 mini bundt birthday cake with either milk or white chocolate drizzle in a personalized box with the birthday persons name, birthday candle, 2 iced cookies (happy birthday), 2 cookies (chocolate chips/snickerdoodle), 1 large 8oz craveable birthday gourmet popcorn and birthday plates , napkins, blow horn, hat and more. Everything you need for the perfect birthday party. We can customize it just for your special birthday receipt, color , foods they prefer etc. Just leave us a note at check out or convo us a message. Your order is shipped USPS priority to guarantee quality of freshness. Must be able to pick up day of arrival to avoid melting due to the heat. See Shipping policies for more details. This makes a perfect gift to evoke birthday memories, or create new ones. It will certainly bring a HUGE smile and make this birthday extra special. We would love to include your special message just leave it in notes at check out. *I appreciate you making my stepdaughter's Birthday a little more special! She loved it. *On time and great quality! *I sent my boyfriend a care package for his birthday, and he loved it. Dale communicated with me throughout, and I was able to personalize the gift for him. It arrived on his birthday! I will definitely do business with them again. Thank you for shopping Nana's , we enjoy serving you. Follow and like us on facebook for a 10% discount. Facebook.com/nanasgourmetgoodies Just like us if you haven't already, then apply code facebooklike at check out. 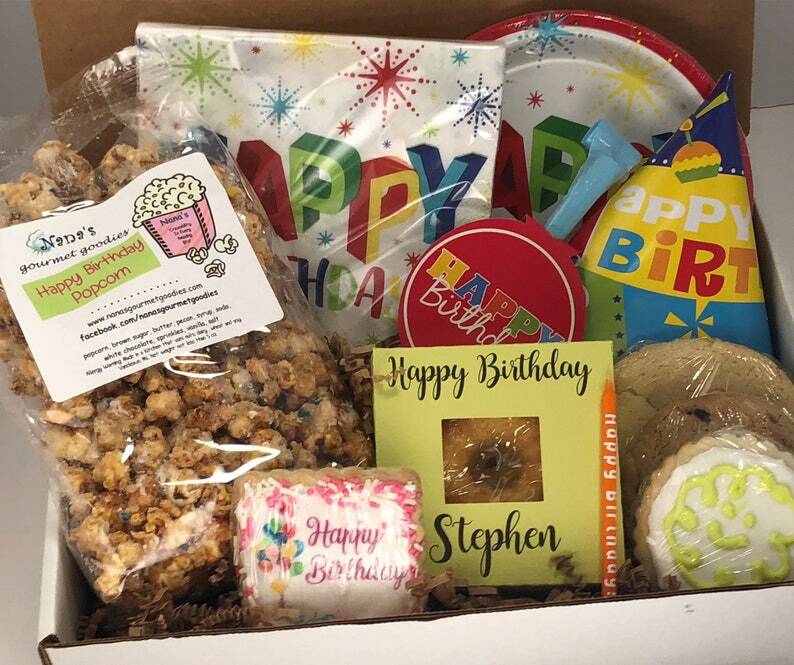 Such amazing customer service - and my son received his box ON his birthday! This is my 2nd time ordering this - once for my daughter and now for my son. Great way to show love!! I highly recommend!! This was a perfect birthday present for my college boy! My husband was very pleased with this birthday box, was eaten quickly. Delicious treats! !